Now that all the entries are in for the OptimisticPenguin.com Figurine Comic Competition, I thought I would share with you the entries and a few comments for each while I prepare to announce the winners. 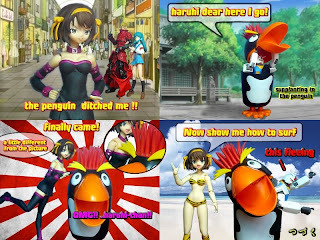 And this is her entry "Rin and a Penguin"
Comment: This story amused me greatly, however I am not sure why Rin is upset about being adopted by a penguin, would be such an awesome honor! Oh and I didn't realize that penguins ate mandarins, lol very good enjoyable story. And this is his entry "Sanae's Penguin"
Comment: This comic is fantastic, just loved it, the storyline was very good incorporating a contest into the contest XD but poor Kero was deceived, no Gunpla prize, oh well very cool comic and cute/creepy Kero-Penguin. And hats off to you for making your own penguin figure. And this is her entry "Battle"
Comment: Interesting story, hmm I wonder if I'd see penguins if someone knocked me unconscious. And the moral of the story is do not get in a fight with Date! lol nice story I enjoyed it muchness. And this is his entry "The Optimized Penguin"
Comment: I really love this story, lol an optimized penguin! lol half glass full, optimistic little chap isn't he, must be to go up again Saber Lily with only his bare wings XD a good story two thumbs up. And this is her entry "Blind Date"
Comment: Oh no a penguin in distress, someone save him!!! 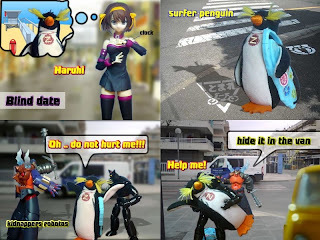 Lol so we have a Gundam who want's a date with Haruhi but changes his mind, not surprisingly, but why is Haruhi on a date with a penguin XD lol that crazy broad, a very fun story.